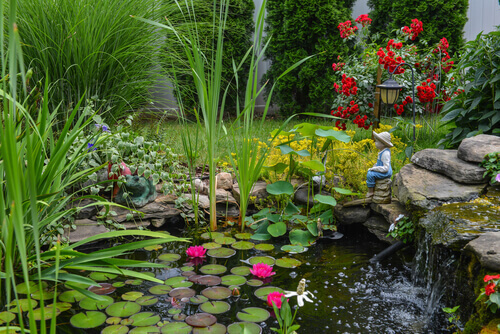 There are a number of benefits to be gained by installing front yard water features. It can enhance the visual appeal of your property, greet anyone who visits you, and can provide a breathtaking view from your front porch. However, there are a number of things you’ll have to consider, the first of which are legalities. Can You Install Front Yard Water Features Legally? Different cities, states, communities and municipalities throughout the U.S. have varying laws regarding what can and cannot be installed in a front yard. This can be a source of contention for some, who feel that as the owners of the property, they should be able to do such installation. However, this isn’t always the case, and it is important to check the local laws in your area to be sure a front yard water feature is permissible. The last thing you want to do is spend thousands of dollars setting it up – just to find out it’s outlawed. Once you’ve confirmed that you’re able to install a front yard water feature within your jurisdiction, the next step is to decide what style you want. This is where things become fun. Water features can be broken down into two varieties, which are formal and informal (natural). Natural water features will be designed in such a way where they closely resemble nature, and will be irregular or asymmetrical in appearance. Formal water features by contrast will always display a symmetrical shape, such as a perfect rectangle, triangle or circle, shapes that do not occur naturally in the wild. Mother Nature does not favor straight lines, so those looking for a natural look will want to avoid them. There are many accessories you can add to water features in the front yard. Bubble rocks, fountains and statues are just a few examples. Ultimately when it comes to design, you are only limited by your imagination. You will also need to decide what type of plants you want to add, as well as whether you’ll include waterfalls. The installation of a good waterfall can be challenging and will drive up the costs of the project; however the end result will be worth it. One thing which makes front yard water features distinct from their backyard counterparts is the amount of repair and maintenance that must be put into them. While ongoing maintenance is a necessity for both front and backyard water features, for the front yard the issue is of greater importance, due to its high visibility. If water features in the back yard go without maintenance for long periods of time at least they are not visible to neighbors or people passing by, while the front yard is completely visible to everyone. Water features in the front yard which are not kept in pristine condition at all times can even lead to complaints from neighbors, so they will require a higher rate of maintenance and care.